Pamana is hard to miss when you pass Aguinaldo High Way in Tagaytay. When you see this white building, park! And eat! You won't regret it! You'll be in for an amazing Filipino / Spanish feast! 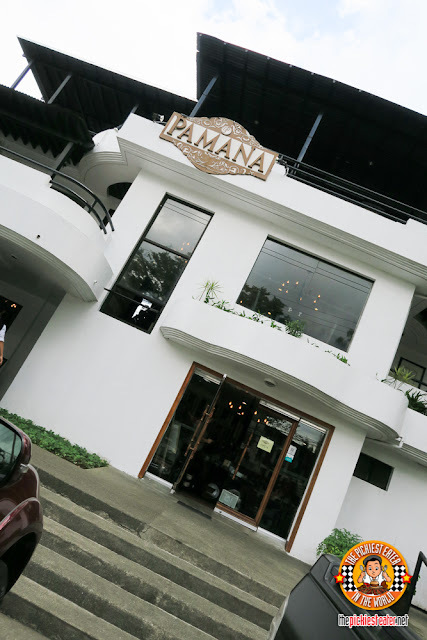 Pamana is one of the many excellent restaurants under the Happy Concept Group. Stepping inside Pamana is like watching a vintage slideshow of the Ongpauco clan. 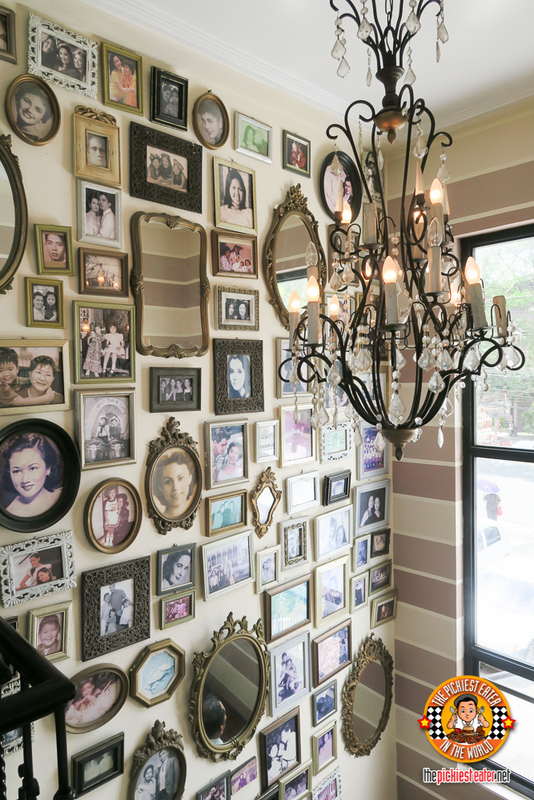 I just love the stairway filled with pictures! The interiors looks like an old Spanish house, but instead of rooms and living rooms, is filled with dining tables. Sometimes I feel old interiors like this are a breath of fresh air. Makes me feel like visiting a grandparents' home! But anyway, let's talk about the food! Practically every dish we had looked special. Like a lot of thought was made into creating the dishes to make sure every bite was unforgettable. 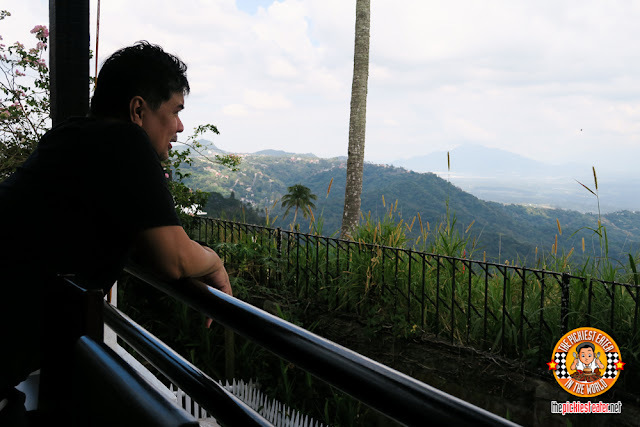 And plus of course the fact that the recipes are literally passed down from generation to generation in the Ongpauco Family. Every recipe is a Pamana from a member of their clan. We started first with this beautiful appetizer served in a wooden board, with different types of bread, dilis, cheeses (including a sizzling one), and there's even sampaloc. 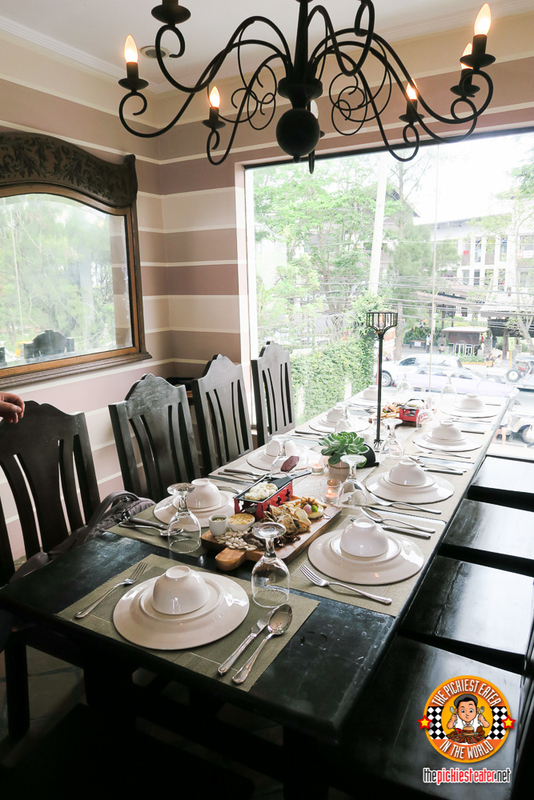 Perfect to gather around in and chow with stories while waiting for the main entrees. Next, the Okoy Bites (P220). and it was gone in seconds. Crispy and tasty! This recipe was handed down to them from their other restaurant called Bahay Malabon. The Nilasing na Mangga (P200) already makes your mouth water just by looking at it. The mangoes are submerged in beer for weeks giving that extra fizz and a just a hint of malty bitterness. Surprisingly, it works! The Crispy Pusit in Squid Ink (P310) was also a crowd favorite. The Calamari fritters were very soft, the Squid Ink sauce breading thing was crispy. So as you can imagine, it was a delight in the mouth! Now, this you have to try! The Sizzling Litid Sisig! A brilliant invention of Happy Ongpauco's husband! Once served, bang the bone to get the bone marrow out! Mix it together and it's heaven! Extra garlic rice please! The Tinuktok (P320) was as good as we last tried it. It's minced coconut meat with shrimps and different herb and spices, and then wrapped in taro leaves, and then cooked in Coconut milk. So for coconut lovers, this one is a must-try! Very comforting! And of course, Seafood Paella ng Pamana (P420). You're probably thinking, aside from the beautiful presentation, what's special about this Paella? I'll tell you. It's cooked in Aligue! Heaven!!! Although I was already so full at this point, I couldn't not taste the Kare-Kare Crispy Boneless Pata at Crispy Tadyang (P650), and it tasted as gorgeous as it looks! If you're craving for lechon manok, you should go for the Lechong Manok na Tinupig sa Gata. I just love the mix of the roast flavor with a bit of sweetness from the coconut. Another inihaw favorite was the Inihaw na Liempo. An addicting mix of grilled pork belly with a bit of heat from the chopped up chili. For those who feel like they always need to have something with noodles as a cast to their lunch or dinner, you've got to try the Sizzling Pancit Ivatan (P370). It's like having all the Filipino comfort food elements all in one sizzling plate. It's their version of pancit canton, topped with delicious dried pork adobo, egg (You had me at egg), and then served with adobo sauce and tuba! It's love! For dessert, the Ginumis with Panucha Ice Cream (P130) can definitely hit the spot on this crazy summer. Created with homemade raw coconut sugar! And last but definitely not the least, the Batangas Pinoy Fondue (P250). Local hot chocolate, and a variety of local rice cakes! We really enjoyed this beautifully presented Pinoy choco fondue feast with our friends as we looked back on all the wonderful dishes we just had. 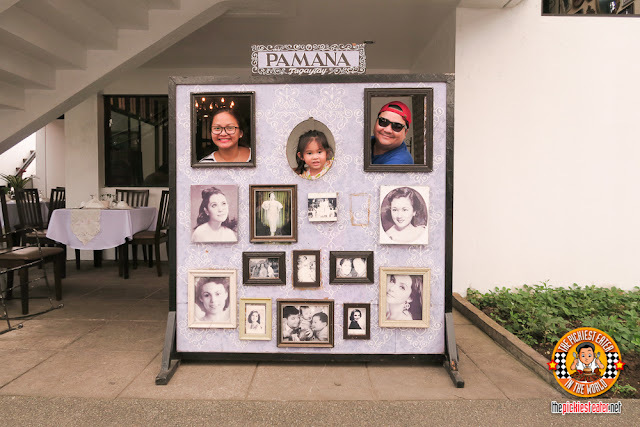 Pamana definitely has a treasure of recipes that we're glad has been passed down from this family's generations, and I for one am glad that it has been made available to everyone!